She may be old, but she still knows how to party. We're talking about The National Park Service, of course. In celebration of the National Park’s centennial, the “Find Your Park” movement was launched with the goal of inspiring Americans to get out and visit a national park. (And it really worked. Record numbers of tourists flocked to the parks this summer!) But even though summer has ended, the visits do not. There are still plenty of reasons to hit the road and check out some of nature’s wonders well into fall and even into the early winter. See below for some out some of our faves. Acadia National Park: Maine Want to feel like a postcard threw up in real life? Head here. Historical? Check. Roads closed to motorized vehicles? Check. Water-color painting inspired leaves? Yup, they have that too. This amazing setting is perfect for anyone who loves to hike or bike and the fall is the perfect time to visit because all of the leaves are red, orange, and yellow and will make for the perfect fall foliage picture. There is also the option of driving the scenic loop along the rocky coastline. Drive 3.5 miles to the top of Cadillac Mountain – it's the highest point along the North Atlantic seaboard and the first place in the U.S. to see the sunrise from October 7th to March 6th. We’ve basically left you with no excuse to skip it. 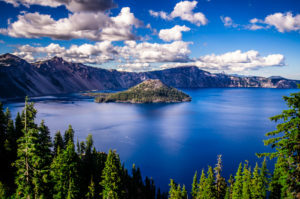 Crater Lake National Park: Oregon This park will take your breath away with its 2,000-foot cliffs surrounding an inactive volcano crater. But, you have to act fast because this park has a very short window for visits. (Even more enticing, right?) Even in July, there is still some snow on some of the hiking trails and by mid-October it’s already winter again. The best time to visit is, well, right now when the weather is crisp and the tourists are long gone. But you can start planning your September 2018 trip now! Did we mention it is the deepest lake in the USA and perhaps the most pristine on Earth? Grand Teton National Park: Wyoming Elk, moose, bears, oh my! If you’re into wildlife, then head to this stunning park, which is a prime animal spotting destination. “You may even witness a sparring match between two dominant male elk,” reads the site. More than that, you’ll be treated to dazzling autumn colors like yellow and orange dotting this cottonwood, aspen and willow tree-filled park. Lassen Volcanic National Park: California There’s a reason Wild author Cheryl Strayed was inspired by this area. The otherworldly terrain is home to all four types of volcanoes found in the world, as well as crystal-blue lakes, giant lava pinnacles, jagged craters and steamy sulphur vents. You’d be hard-pressed to find a reason not to write home about it! Be warned: The weather can be unpredictable with temps ranging from high 70s to the low 30s, so check the park's website and pack for all seasons before you visit. Olympic National Park: Washington There may not be many fall colors to stare at in this park, but there is an even bigger draw in the autumn: salmon spawning season. You can watch National Geographic come to life when the Coho salmon leap up the Quillayute and Sol Duc Rivers and October is the best month to see them. Redwood National Park: California Who needs changing New England leaves when you have redwoods that are stunning all year round? This forest has countless trees, which soar more than 300 feet high and are wider than the average car. Bonus: In the fall, this park tends to be deserted enough that it’s easy to spot black bear, elk, bobcats, mountain lions and whales. Yes, whales. You certainly won’t seem them gallivanting through the forest, but you can spot them as they pass along the redwood coast in fall and late winter on their way from Alaska to Baja. The best spot to view them out is from the Crescent Beach Overlook. Rocky Mountain National Park: Colorado A visit here is all about reaching great heights. That’s because The Trail Ridge Road in the Rocky Mountain National Park tops out at over 12,000 feet. What did you think we were talking about? From this excellent vantage point you’ll be able to view the gold aspens, hear the mating calls of the elk (something that only happens in fall) and spot a bighorn sheep. 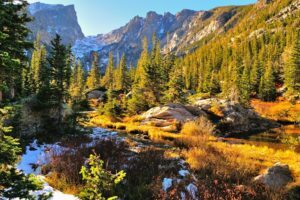 There are around 300 miles of trails to hike including the Keyhole Route, a rocky climb which leads up to the park’s tallest mountain: Longs Peak. Great Smoky Mountains National Park: Tennessee and North Carolina Perhaps one of the greatest symbols of Americana, The Great Smoky Mountains are a National Park must. Each year the fireflies put on a synchronous light show here and as home to the largest stands of old growth forests in the eastern U.S. the trees are a sight to see this time of year because of the vibrant colors. Beat the crowds by coming during weekdays or before 10am. Yosemite National Park: California If you’re in search of an eternal summer, Yosemite is your park. Made up of mostly evergreen trees, it is not known for its fall foliage. Instead, you will get granite cliffs, ancient giant sequoias, and waterfalls practically all to yourself in October and November. Some of the park’s waterfalls, including Vernal, Nevada, and Bridalveil, run all year, making it the perfect escape if you’re not quite ready to give up warmer months. Zion National Park: Utah Like avocados, fall foliage seems to be hard to catch at its most perfect, ripest moment. And if you put off your plans to drive and see the leaves, you may arrive to find that everything has already turned barren! 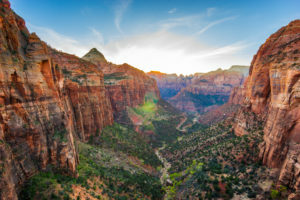 But book a trip to Utah and you’ll be fine — because Zion National Park encompasses a large elevation range meaning fall color typically extends from September (in the high mountains) into November (in the lowlands). To get the most bang for your buck, get there during sunrise or sunset to see the rocks give off that famous fiery red-gold color. Denali National Park: Alaska While most people visit this park in the summer, the fall is when you can see the most magical of things in this Alaskan park. From the fall foliage and snowcapped mountains to bears and the Northern Lights, this place is like Narnia in the autmn. You'll be totally amazed. Badlands National Park: South Dakota Time to get down with your bad self. Well, your Badland self, anyway. 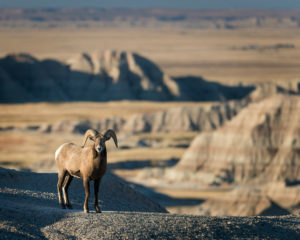 The 240,000-acre park is most alive in the fall with animals like bison, bighorn sheep, prairie dogs and ferrets that come out to romp around. A hike along the Fossil Exhibit Trail will reveal replicas of significant fossils and prehistoric creatures that once wandered this region. Bryce Canyon National Park: Utah This park can be too hot to handle … in the summer, that is. That’s why visiting here in the fall is the perfect way to enjoy a more comfortable hike as temperatures cool and the trails are less crowded. It’s also the perfect time to head up The Rim Trail where you will get unbelievable views of the hoodoos – the park’s famous tall and thin spires of rock. Just keep an eye out because you will most likely run into wild animals like pronghorn sheep. Mesa Verde National Park: Colorado Longhouses, wigwams, teepees and adobe houses ... test your grammar school history skills by making your way to this park, which is filled with Native American archaeological sites. The Spruce Tree House cliff house dwelling is the best preserved and you can even reach it by yourself. Make sure to get up to the Balcony House and the Cliff Palace where you can get a first-hand look at history, just beware of uneven steps and rustic ladders. 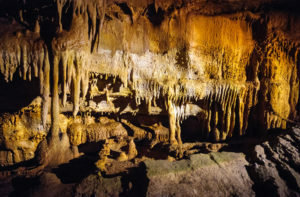 Mammoth Cave National Park: Kentucky It’s all about getting low at this southern park, which boasts 400 square miles of underground caverns and make up the world’s longest cave system. Highlights include the Frozen Niagara section (known for waterfall-like flowstone formations) and Gothic Avenue (where the ceiling is covered in 19th-century visitors’ signatures). Don’t forget to look up – the scenery above ground is made up crazy formations like the Cedar Sink sinkhole. Glacier National Park: Montana Check a famous filming location and natural wonder of the world off your list in one trip. Glacier National Park was used during the filming of Forrest Gump and is also home to some of the most spectacular mountain scenery in the country. There’s a reason the filmmaker chose the mountain scene near the St. Mary entrance as Tom Hanks’ character described it as looking “like there were two skies one on top of the other.” Snap a picture there before walking along the more than 700 miles of hiking trails, which will lead you to another photogenic spot: Hidden Lake.